I've found a type of misprint that wasn't yet listed on these pages and thought that it should be included here. Italian The Dark exists with normal fronts and blank white unprinted backs. These cards look very much like artist proofs, however, NO artist proofs were made for this set, which means these are definitely misprints. I've seen every card in the set with this misprint except for Angry Mob, Diabolic Machine, Goblin Wizard, Preacher, Rag Man, & Scarwood Bandits. I've seen 2 copies of the cards Reflecting Mirror, Riptide, & Wand of Ith. Each of those cards appeared on the sheets multiple times, so there isn't any evidence that more than one of each sheet exists. Most of these cards that I've seen came from a man in Portugal who purchased them at a flea market because he had not seen cards like these before. They seem to have come from someone who had tried to collect them all. Separately, I've also seen one (Reflecting Mirror) that a man in Italy had purchased in a collection. I've thoroughly checked the cards under magnification and compared them to regular Italian The Dark cards, and other white back (artist proof) cards I own. These misprints are definitely real cards with unprinted backs. They've not been falsely manufactured or chemically wiped in any way. UPDATE: More of these have been reported to me. Someone received them in a collection which had come from a Wizards employee who was responsible for replacing cards that had been returned due to quality control issues. It's been some time ago, and he doesn't recall specifically which cards he had, but he believes that all of his were commons. Last edited by cataclysm80 on Fri Jun 24, 2016 8:22 am, edited 2 times in total. cataclysm80 wrote: I've found a type of misprint that wasn't yet listed on these pages and thought that it should be included here. I've seen 2 copies of one card. Added with few others that were missing. 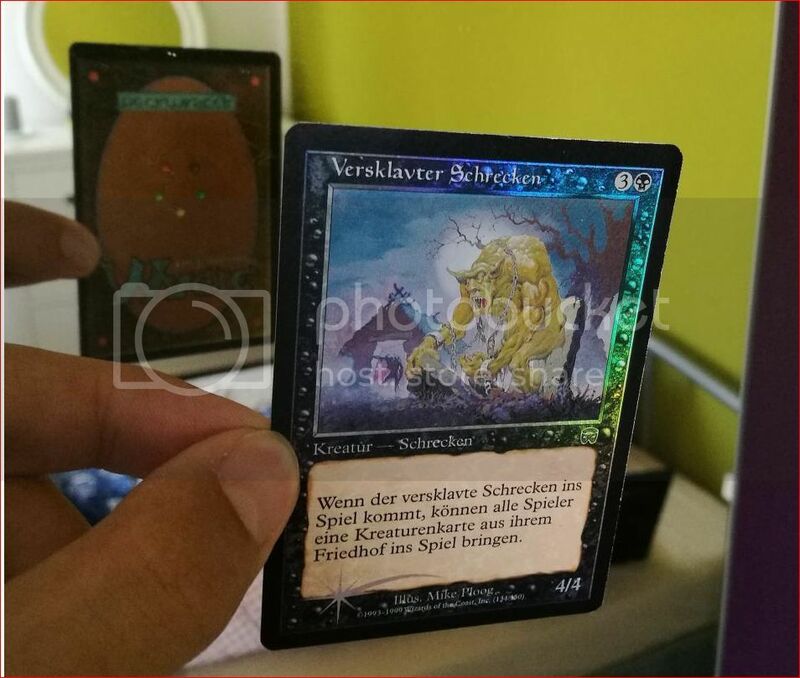 Looks like there is a german Mercadian Masques Foil UC Sheet with upside down backs. Looks like it's not the whole back which was printed over the front, but only the blue layer of the back.